It’s now estimated that 8 out of 10 adults will experience back problems at some time during their lives. This is borne out by our experience, with David having treated more people with back – or neck – problems than anything else. Given this, it’s not surprising that there are so many conflicting pieces of advice about what causes back pain and, more importantly, how to relieve it. Sadly, many of these fall into the “Old Wives tales” category – or myths if you prefer (!) – and only prolong the problem, rather than helping speed it on its way. So, this week, we’re going to put those we hear most often under the spotlight and see if they’re really true. Myth Number One. You should take it easy and rest your back. This is the one we hear most often and, in most cases, isn’t going to help at all. The reason for this is that muscles weaken with rest. And – here’s your bizarre fact for the day (!) – it’s estimated that they lose their strength four times faster than you can build them up. If you’d prefer a figure, this equates to 1 to 1.5% of muscle loss a day. While it may not sound like much, it quickly builds up to a real problem over a relatively short period of time. As a result, the back is less supported by the surrounding muscles and so has to carry a greater load. Ironically this can then lead to further back problems and a downward spiral begins. At the same time bed rest has other consequences, particularly over the longer term. These include reduced heart function and bone density, as well as an increased risk of blood clots. Having said that, there is one case when bed rest is necessary and this in the case of acute pain. And we’re not talking about a bit of an ache or stiffness. Rather the type of pain that has you thrashing about in agony if you try to move or, sometimes, simply from breathing more deeply than usual. Here a day or two’s bed rest, to reduce pressure and inflammation, can help although it’s important to get up and about as soon as possible. More about this in a moment. However, as with any acute pain, we would always advise you to seek appropriate medical advice asap. Myth Number Two. You must not take any exercise. As you can now see – with the caveat for acute pain (!) 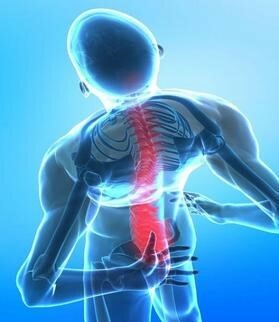 – total rest is not the answer to back pain. Rather it’s about keeping yourself mobile and listening to your body. Gentle stretches, walking and not remaining in one position for too long, whether sitting or standing, will all help. This is particularly the case if you sit for periods of time in front of the computer or in the car. It will make a real difference if you remember to get up regularly, walk around and have a gentle stretch. Obviously you shouldn’t be taking strenuous exercise at this time, but there’s no reason why you can’t return to more active sports once you’re fully recovered. Having said this, it would be a wise precaution to check that you’re using the best – and up to date (!) – equipment AND that poor technique hasn’t unwittingly contributed to the problem. Or how often people have never taken any advice – or had a lesson – for their favourite sport. Again, running is a prime example or this, where people just go and do it, not realising the longer terms effects of poor technique. As an aside, there’s also a good reason why some injuries are named after a particular sport, such as tennis elbow or golfers elbow. You have been warned. Myth Number Three. If you’re physically active, you shouldn’t get back pain. While it’s true that the fitter you are, the less likely you are to experience back pain, it’s still possible that you may do so. However, if you are fitter, you’re likely to recover more quickly than someone who is sedentary and less fit. There’s no doubt that some sports and activities are higher impact or carry a greater risk of injury. And, dare we say that age can play a part too, which is why some sports or activities are better suited to younger people. And, as we’ve already mentioned, poor technique or equipment can cause unforeseen problems longer term. Perhaps a little common sense is needed when choosing an exercise that you enjoy and suits your body – and age (!?!). Myth Number Four. It’s easy to injure your back. Thankfully, this isn’t the case. The back and its surrounding muscles, tendons and ligaments are incredibly strong but flexible. They provide a strong core for the body and are remarkably resilient to the demands we place on them. Myth Number Five. If you feel pain it means you’ve damaged your back. Myth Number Six. There’s a back problem running through the family and so I’m likely to have it too. The good news is that, in the vast majority of cases, there’s no genetic link. Lifestyle and poor posture are much more likely causes, particularly as people are becoming increasingly sedentary. Myth Number Seven. As I had back problems when I was younger, it’ll only get worse as I get older. Again, this isn’t automatically the case. Just because you’ve had a back problem in the past, it doesn’t mean that it’s going to happen again in the future or get worse. It’s more about whether you take steps to look after your back in the future and address any likely causes. Myth Number Eight. There must be a specific underlying reason for the back problem. An x ray or scan will show what’s wrong. In many cases there’s very little to be seen on an x ray – which only shows the bones and often not in much detail – or scans – which show some soft tissues as well. This means that if you’re wanting a definitive answer, then you may not get one. • Take a regular form of exercise you enjoy and ALWAYS warm up and stretch before you start AND when you finish. • Consider doing Pilates and Yoga to strengthen your core muscles. Just 10 or 15 minutes a day can make a real difference. • Be aware of your posture. As your Mum used to say, don’t slouch! • Make sure your chairs and car seat have good lumbar support. • Don’t stay in one position for too long. If you’re sitting, get up regularly to walk around and stretch. • When you bend over or pick things up, use your legs to straighten up, not your back. • And, for the girls (! ), wear low heeled shoes. • Make sure you sleep on a firm mattress and on your side, to reduce pressure on your back. • Keep your weight under control, excess weight only makes things worse. • Vitamins D and K alongside a good quality calcium, magnesium and phosphorus supplement will help to keep the bones strong.